I love referrals. Honestly, it is one of the best forms of flattery for a photographer. So when Lauren contacted me for session info and said I came "highly recommended" I was stoked! But then it really puts the pressure on. Not that I don't want every session to be perfect, but ensuring you meet a clients expectation can be a little intimidating. However, my concerns were eased right after I met Lauren and her family. They were so easy going and it was probably one of the easiest family shoots I've done. Even baby Drew was super laid back :) Not one tear, tantrum, or fuss. I think the most favorite part of this shoot was baby Drew's eyes. They are so bright and blue - just stunning! I hope you enjoy seeing the pictures below. 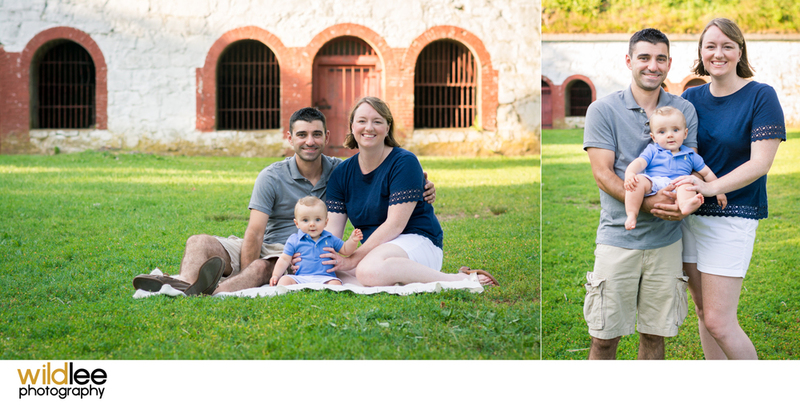 Oh and the shoot was taken at Fort Seawall in Marblehead Massachusetts. If you have not visited Marblehead - do it! Beautiful quintessential New England Town with great history and scenery.